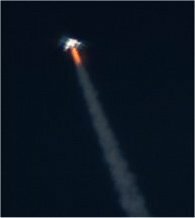 RLV (Reusable Launch Vehicles) News offers brief articles and comments concerning developments in the area of space transport, which includes vehicles for earth launch to orbit, suborbital spaceflight, and in-space vehicles. It also provides lots of links to news articles, announcements by commercial rocket developers, NASA events, etc. links for various reusable space transportation systems around the world. RLV Table compares a selection of space transport vehicles. RLV History looks at earlier vehicles and designs. ... Testing versus simulation is a difficult issue for the Shuttle RtF: NASA warned over shuttle safety modelling - New Scientist - Jan.31.05. SpaceX contains costs with simplified approach - Florida Today - Jan.29.05. ... Correction: Luke Colby pointed out that in the entry below I had left out the link to his feedback comments and also that the link to the Boston University aerospike item in the rocketry archive was not working correctly. He also wants to make it clear that he is not "calling for massive antigravity funding and dinner with the little grey men from Roswell!" He just wants to point out that the field of gravity research is an active one with many credible scientists involved. 1:15 am: Lunar Transportation Systems is a venture formed by Walter Kistler and Bob Citron to develop a "new Earth-Moon transportation system." The system uses four vehicles, which share many structural features. A propellent tank transfer scheme for in-space refueling allows for the Lunar Lander "to carry payloads from LEO to the lunar surface and return payloads from the Moon to the Earth". BELLEVUE, WA, January 28, 2005—Walter Kistler and Bob Citron formed Lunar Transportation Systems, Inc. (LTS) early last year in response to the President’s new Vision for Space Exploration. LTS’s goal is to raise major financing from the private sector to develop, build, ground test, flight test, and operate a new Earth-Moon transportation system. Initially, the government would be an important customer, and eventually, LTS would serve new lunar commercial markets. The two entrepreneurs have a long history of stimulating new space market activities using private investment. Kistler founded Kistler Instruments AG and was the first investor in SPACEHAB, and co-founded Kistler Aerospace Corporation with Bob Citron, who also founded SPACEHAB. LTS goals also fit nicely with the new White House Space Transportation Policy, which recognizes the need for commercial systems, particularly for launch and exploration. The new policy echoes the President’s vision and encourages the government to facilitate commercial space activities. Lunar Transportation Systems, Inc. has launched a website to introduce its innovative concept to create the equivalent of a two-way highway to the Moon as part of NASA’s new space exploration plans. The website, www.lunartransportationsystems.com, contains a lot of detail about their plans, including descriptions and artwork of LTS spacecraft, lunar architecture, mission profiles, trade studies in progress, as well as photo and video galleries. This is the second new private organization, Transformational Space being the first, to offer a complete CEV Earth/Lunar system that needs only the currently available launchers. No new heavy lifter is required. I'm wondering, though, how LTS can get in the game since the first set of NASA study contracts was already awarded last September. 1:15 am: News brief... X PRIZE Space Race News has posted more updates on rocket development projects. These include Bristol Spaceplanes, HARC Liberator / Orion Propulsion, and Micro Space. ... Two majors cooperate on a CEV proposal: Northrop Grumman, Boeing Finalize Space Exploration Teaming Agreement - Northrop Grumman - Jan.24.05. 1:25 pm: Armadillo update... John Carmack has been too busy with Id Software projects and other tasks lately to post regular Armadillo updates but the work continues. The forum at Space Race News got this Quick Update - Official Armadillo Q&A thread - Jan.24.05, which reports on a recent attempt to launch a prototype. 1:25 pm: Orion hopes... Sam Dinkin examines the pros and cons of nuclear bomb propulsion in Revisiting Project Orion - The Space Review - Jan.24.05. The Orion scheme would be the ultimate space transport but the political opposition seems insurmountable, at least for a ground launched system. A purely space based system might survive the onslaught of anti-nuke forces but the huge amount of mass required makes this an unlikely near term option. Perhaps it will be feasible when a low cost cargo train to orbit becomes available via a space elevator or laser propulsion. A test of pulse propulsion via external explosions is shown in this cool video posted with the article: The Road Not Taken (Yet) by Glenn Harlan Reynolds - TCS - Sept.11.02. Note that Reynolds, a lawyer, says that the Orion vehicle should pass the Outer Space Treaty since a "nuclear 'bomb' used for space travel, arguably, isn't a 'weapon' " just as the converted missiles used to launch astronauts in the early 1960s were not weapons. 1:25 pm: Europe's Space Prize? Yet another space-related essay in the Wall Street Journal - Space: The Private Frontier by Jacob Funk Kirkegaard - WSJ.com - Jan.24.05. Unfortunately, like the others, it requires a subscription. The main theme is that Europe should follow the lead of the US and do more to encourage private, entrepreneurial approaches to space development. The author suggests that Europe fund its own version of America's Space Prize since the rules for that contest require participating organizations to be based in the US. He also urges the development of a regulatory framework for commercial human spaceflight like that in the Commercial Space Launch Amendments Act. 2:25 am: News briefs ... The Rocket Company by Patrick J. G. Stiennon and David M. Hoerr, with illustrations by Doug Birkholz, tells the story of the development of a two-stage orbital space transport system. Though fictional, the book provides an excellent introduction to the technical aspects and challenges of designing a cost-effective, fully-reusable rocketship. The book was provided here in serialized form over several months and became a popular part of HobbySpace. There is good news and bad news to report about the book. The good news is that the book has been accepted for publication in print by a reputable publisher. (I'll post information on where it can be purchased as soon as I'm told.) The printed version will contain revised and updated material, a new chapter, and over 30 illustrations. The bad news is that the publisher has, not surprisingly, asked that the text be taken off line. I've now done this for everything except Chapter 1 and Chapter 4 , which I'm allowed to post here as samples. My congratulations to Patrick, David, and Doug on the publication of the book. I want to thank them for kindly letting me post it here. I believe their work will have a significant influence on space transport design by one or more companies in the not so distant future. ... HS visitor Dave Ketchledge offers some feedback on the suggestion of launching an upgraded Gemini on top of a Falcon V.
11:15 am: SpaceX vs. the Majors ... The Wall Street Journal article (subscription only) mentioned back on Dec. 28th that dealt with a conflict between SpaceX and Northrop over pintle injector technology and conflicts of interest is available for free here: Can defense contractors police their rivals? - Military & Aerospace Electronics Magazine - Dec.28.04 (Distributed by AP). Note that SpaceX and Boeing also had a conflict over the Falcon when Boeing insisted that SpaceX re-qualify a range safety device rather than use a Boeing report written for the Air Force. (See RLV News April 24, 2004). 11:15 am: CEV definitions... Someone at sci.space.policy noted that the Crew Exploration Vehicle Solicitation Documents (mentioned below) includes a glossary (doc file) that defines the acronyms used by NASA and is actually quite informative. Crew Exploration Vehicle (CEV) - The CEV provides crew habitation and Earth re-entry capability for all Exploration Spirals. In Spirals 2 and 3, the CEV has been functionally defined as the vehicle in which the exploration crew will be transported to the lunar vicinity and subsequently returned to the Earth surface. The CEV will also have the capability to perform automated and/or autonomous operations (loiter), from LSAM separation from the CEV for descent to the lunar surface, until the end of the lunar surface mission. "Spiral" is NASA's term for a stage in the development of the CEV system starting from earth-to-orbit crew delivery and then gaining the capability to send people to land on the Moon and eventually Mars. Exploration Spiral 1 (Crew Transportation System Earth Orbit Mission) - Encompasses the capabilities necessary to insert humans into Earth orbit and return them safely to Earth, employing a post-Space Shuttle flight system. A programmatic constraint has been imposed on Spiral 1: "NASA shall conduct the initial test flight for the Crew Exploration Vehicle before the end of the decade in order to provide an operational capability to support human exploration missions no later than 2014". The flight elements of the Exploration Spiral 1 Crew Transportation System are the Crew Exploration Vehicle and Crew Launch Vehicle. Robotic Precursor Missions that are scheduled to launch prior to the Earth orbit demonstration of the Spiral 1 CTS are considered Exploration Spiral 1 missions. Spiral 2 or "Extended-Duration Lunar Campaign" refers to a system capable of a 4-14 day mission on the Moon between 2015 and 2020. Spiral 3 or "Long-Duration Lunar Campaign" will provide for 14-98 day lunar missions. Sprial 4 will allow for a crewed mission to fly to Mars but not land. Spiral 5 will put people on Mars. Crew Exploration Vehicle Launch Segment (CEVLS) - The CEVLS consists of a Crew Exploration Vehicle (CEV), a Crew Launch Vehicle (CLV), and all the dedicated ground support infrastructure necessary to launch the CEV to Earth orbit. Crew Transportation System (CTS) - The CTS encompasses the flight elements needed to deliver a human crew from Earth to a mission destination, and return the crew safely to Earth. In Spiral 1, the CTS includes the CEV and CLV. For Spirals 2 and 3, the CTS includes the CEV, CLV, plus other elements to be defined at a later date such as EDS [Earth Departure Stage] and the LSAM [Lunar Surface Access Module]. The CTS must interact with the Ground Support System (GSS) during all Spirals; current architectures require delivery of the EDS and LSAM through use of the CDS to rendezvous orbits. Though Spiral 1 drags on till 2014, there will be some flight tests before then: "Phase 1 - Demonstration of a flight test in 2008 that minimizes risk for the CEV to be delivered in 2014." 1:55 am: News brief... Via Space Race News comes reports on recent near space projects and tests by JP Aerospace. ... I don't understand how these things work but the part about "Cost-Plus-Award-Fee (CPAF) contracts" sure sounds like something that would put your typical Big Aerospace manager into a state of delirious lust and desire: NASA Letter to Potential Offerors to Review The Draft Crew Exploration Vehicle solicitation - NASA/Spaceref - Jan.21.05. * Crew Exploration Vehicle Solicitation Documents. 12:35 pm: News brief... With the delay in the Falcon I launch, I guess this news was to be expected: Falcon V launch delayed - Space Race News! - Jan.20.05. ... The Washington Post profiles Guillermo Soehnlein and the International Association of Space Entrepreneurs, which he founded: A Launching Pad for Space Entrepreneurs - Washington Post - Jan.20.05. ... I hope that "new ways of looking at human spaceflight" will happen at NASA: Time for decisions: NASA should think outside the box as it develops its moon-Mars plan - Florida Today - Jan.18.05. ... I was pointed to this thread for a suggestion on how the Falcon V could launch a crew: Gemini: We can rebuild it, we have the technology - Space.com Forum - Oct.18.04. 10:35 am Successful SpaceX engine test took place last Friday in Texas: Race for Next Space Prize Ignites - Wired - Jan.18.05. (Link via HS reader K. Luojus). This was apparently the first time the Merlin first stage engine fired without problems for the full 160 seconds required if the Falcon I is to get its payload to orbit. Musk told Wired News that he intends to win America's Space Prize, and that he can do it by the Jan. 10, 2010, deadline (that's when Bigelow wants to open his commercial space station for business). The space prize is right in line with Musk's business plan. "We hope to be the company that takes people back and forth from Earth to either the International Space Station or to Bigelow's space station, or to applications we don't know about today," said Musk. Ultimately, though, his ambitions extend beyond even orbit. "I think it's very important that we become a spacefaring civilization, and that we eventually become multiplanetary." ... The NY Times reports on Bezo's Texas space base plans: Add to Your Shopping Cart: A Trip to the Edge of Space - NY Times - Jan.18.05. ... More about the launch of the X PRIZE Cup as early as this year: X Prize Cup may start in Sept. - Las Cruces Sun-News - Jan.13.05. ... Peter Diamandis talks about the X PRIZE teams staying in the suborbital spaceflight game: Other X Prize Teams Pressing On Toward Flight, Diamandis Says - Aviation Week - Jan.14.05. 12:45 am: More dot.com spacers... The X PRIZE Foundation has announced that Larry Page, co-founder and president of Google and a billionaire after the company recently went public, will become a trustee of the foundation. Also, SpaceX chief Elon Musk joined along with Jack Bader of St. Louis based NetEffects.com. 12:10 am: Blue Origin launches in West Texas... Jeff Bezos has revealed that Blue Origin will build a suborbital spaceflight facility at his huge ranch in West Texas. Alan Boyle gives details in Amazon founder unveils space center plans: Bezos’ Blue Origin venture - MSNBC - Jan.13.05 (plus an entry at Cosmic Log). The company will operate a vertical takeoff and landing vehicle (VTVL) from the site. Negotiations have begun with FAA/AST for a spaceport license. Vehicle development, however, looks to be stretched out since the article says, "Flight operations could begin in as soon as six or seven years." Note that both TGV Rockets and Armadillo Aerospace could be flying VTVL vehicles to 100Km in two to three years. The air launched SpaceShipTwo is expected to begin operations by 2008. ... Space Race News reprints a couple of items related to the X PRIZE Cup and New Mexico. The governor appoints a new director of space commercialization and this brief item from a TV station confuses the X PRIZE and Cup formats. It does give the somewhat surprising news that the first Cup event might happen as early as this September. I wasn't expecting it before 2006. 2:15 am: Eclipsing old aerospace... I recently commented in the Space Log section about the development of the Eclipse Very Light Jet and how that company's struggles compared to those of the alt.space firms that want to prove that space hardware can be built far cheaper than it usually is. The article Cheap Jet Update - Forbes - Jan.10.05 underscores this theme. The author highlights the "hyperconservative" nature of the business jet industry, which is reluctant to upgrade its technology and manufacturing methods because it doesn't believe a market will appear if lower prices are offered. "Thus bizjets remain inefficiently manufactured; costs and prices remain high; and the pool of buyers stays small. We have here a classic case of self-fulfilling prophecy." This reminds me of stories I heard about the DC-X team that tried to convince MacDonald Douglas management to pursue RLV development on its own. The managers just couldn't believe that a market would appear that would demand enough flights of a low cost, low margin reusable vehicle to make up for the lost revenue from no longer launching their high cost, high profit ELVs. Eclipse already has 1400 orders and the company says it will break even at just 500 because of advanced manufacturing techniques like friction-stir wielding. If the Eclipse succeeds in making money, perhaps it will shake up not just the bizjet industry but all of aerospace. P.S. This project also highlights a point made by Elon Musk in my interview with him and also by Burt Rutan in his presentation at the Space Frontier meeting - projects need to start off with sufficient "capital to reach the finish line". Unexpected setbacks are bound to occur and money will be needed to overcome them. 7:35 pm Shuttle tech - the sounds of the 70s ... The Wall Street Journal has an article (subscription required) about the bankruptcy of the last company in the world making high quality tape for reel-to-reel recorders. That's bad news for audiophiles who claim music on such tape "confers a warmth and richness to recordings" not found in digital files. "The crunch reaches far beyond the recording industry. The National Aeronautics and Space Administration uses Quantegy tape on its space shuttles to record information ranging from pressure to temperature. This week NASA has been trying to buy 20 reels from Quantegy." I don't think this is because sensor data on tape has greater warmth and richness but is just another sad sign of the obsolescence of shuttle technology. 2:55 pm: News brief... SpaceX plus Surrey Satellite pursue smallsat/low cost launcher synergy: Surrey Satellite Technology Limited sells stake to SpaceX: Deal unites firms with shared vision of affordable access to space - Univ. of Surrey - Jan.11.05. (via spacetoday.net). ... Comments to the House of Representatives by Rep. Dana Rohrabacher about the "frontiers of imagination": ‘A Second Kind of Frontier’: The X Prize Triumph and the Future of Space Travel - The New Atlantis -Fall2004/Winter2005 issue (via spacetoday.net). 10:15 am: SS2 to CEV ... Buzz Aldrin and Taylor Dinerman, who has a regular column in the Space Review, have an opinion piece today in the Wall Street Journal: 2005: A Space Odyssey by - WSJ.com - Jan.11.05 (subscription required). They advocate that NASA take advantage of the development of space tourism vehicles for the CEV. The embryonic space-tourism industry gives NASA new alternatives for spacecraft development. Future versions of SS1, or a Multipurpose Crew Module, could be the basis for a versatile yet low-cost NASA CEV. One version could carry six to eight astronauts from Earth into orbit. This could fulfill all personnel transport roles of the CEV and could even be used on the Moon itself, as the crew compartment of a manned Lunar rover. These vehicles would share the same pressurized shell, similar life-support systems, and a standardized docking mechanism and attachment points for attitude control and propulsion thrusters. Most important, they'd all be built on the same production line. If it is to succeed, evolved versions of this craft will remain in production for 40 or 50 years. If NASA and industry can get the design right today, the payoff over the life of the program will be huge. On the other hand, any mistakes made in the early phase will lead to delays and increased costs that could cripple future exploration missions. Relatively small entrepreneurs might be able to do the work faster, and at less cost, than the aerospace giants, but they'd need a less bureaucratic contracting system than the one that exists today. This is, of course, music to my ears. We can hope that NASA will be more amenable to taking advantage of privately developed hardware than it was in the 1980s when it actively discouraged suggestions that it use the Industrial Space Facility, a low cost space station developed by a company led by Max Faget. ... I linked to a Wired article on Richard Branson back on Dec. 28th (I probably got the link from spacetoday.net) but a scan of various space blogs shows that the article wasn't noticed much till this week. Here it is again in case you missed it: Rocket Man: Richard Branson conquered the world. Now he wants to fly you to space. - Wired - Jan.05 issue. 1:55 pm: News brief... "XCOR Aerospace was at the heart of the legislative battle to open doors to commercial space travel": Bill boosts space tourism - Antelope Valley Press - Jan.10.05. ... A.J. Mackenzie looks at the question of how the US government can best encourage commercial space development. Tax incentives may be less useful than providing demand for space goods and services: Tax policy and space commercialization - The Space Review - Jan.10.05. ... The astronauts just want to get going: Astronauts Express Confidence in Safety of Planned Mission - The New York Times - Jan.8.05. My legs shook as I left the plane. Mission accomplished. I had faced down my fears, had experienced unbelievable fun and fulfilled my oldest, wildest dream. More importantly, I had taken one small step toward spaceflight. ... Jon Goff at Masten Space Systems gives an update on their igniter project: Igniter Project Status - MSS blog - Jan7.05. As Jeff Foust notes - Space transportation policy finally done - Space Politics - Jan.6.05 - the administration maintains many existing policies such as supporting both the Atlas 5 and Delta 4 EELV programs. The policy also is consistent with previous plans to fly the Shuttle until 2010 (so that NASA can finish the ISS assembly) and to develop the CEV by 2014. The famous four year gap with no US human spaceflight capability remains. The Commercial Space Transportation section is quite encouraging. It says the US Government is "committed to encouraging and facilitating a viable U.S. commercial space transportation industry that supports U.S. space transportation goals, benefits the U.S. economy, and is internationally competitive." It instructs the government, for example, to purchase "commercially available U.S. space transportation products and services to the maximum extent possible, consistent with mission requirements and applicable law." We can hope this modifies NASA's well known obliviousness to the space transport development activity in the private sector. Ideally it would simply state what space transport services it needed, e.g. X number of astronauts delivered per year to the ISS, and give the contract to the lowest bidder, regardless of the system used by the company. However, I expect that NASA managers will only see the word "develop" in the instruction that the agency "maintain the capability to develop, evolve, operate, and purchase services for those space transportation systems, infrastructure, and support activities necessary to meet civil requirements, including the capability to conduct human and robotic space flight for exploration, scientific, and other civil purposes." 7:15 pm: Rocketing employment... And speaking of space transport companies, they are now in hiring mode: X Prize launches spaceport hiring boom - Antelope Valley Press/Space Race News- Jan.6.05. I hear XCOR, for example, is looking for composite engineers and technicians. ... The first SpaceX Falcon I launch is now expected in March: Astronotes: Private Rocket Liftoff Pushed to March - Space.com - Jan.6.05. A pad firing test must be carried out before then. ... Maybe someday we will see an orbital "reusable" launch vehicle that doesn't require the arrival of a barge before every flight: Shuttle tank arrives at Kennedy Space Center - Spaceflight Now - Jan.5.05. 5:40 pm: Rockeplane Man... Rand Simberg interviews Mitchell Burnside Clapp of Rocketplane Ltd.
... Check out also John Garvey's recent interview, which is now available in the archive. His company, Garvey Spacecraft Corporation, collaborates with students at Cal State Long Beach. The team has succeeded with several ambitous rocket projects, including the first flight of a liquid propellant aerospike engine. He talks about the struggle to carry out these projects with very little funding. An interesting note is how the big aerospace companies have actually undercut them (by stealing away students and staff) rather than support their program. 11:35 pm: Alt.space timeline... I've assembled a timeline that lists some of the most significant developments in the alternative space development movement during 2004. 11:35 pm: X PRIZE fund raising... The X PRIZE Foundation raises over $30K from the public and this results in over $60K total with the matching grant: The $100,000 matching dollar challenge ended - Space Race News! - Jan.1.05.